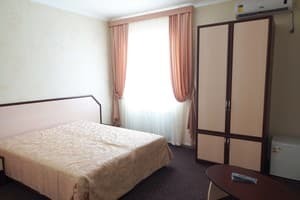 Mini-hotel "Oscar" is located at a distance of 1 km from the cultural center of the city. The convenient location of the hotel allows you to easily reach any part of the city. The hotel has 11 comfortable rooms of different categories. All the rooms of the Oscar Hotel are well furnished, designed in a classical style. 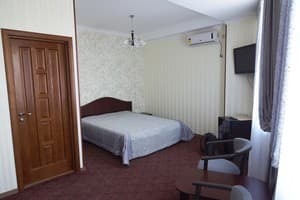 Each air-conditioned room is equipped with a fridge, flat-screen satellite TV, electric kettle, private bathroom with hairdryer and essential bath amenities. Free Wi-Fi is available throughout the hotel. Within walking distance from the hotel there is a park area with the Salgir River, a large clothing and grocery market, shops and cafes, and a large shopping center "FM" is 10 minutes away. The distance to the Belbek airport is 62.7 km. PRICES MAY CHANGE, IT IS REQUIRED TO RECEIVE INFORMATION FROM THE OPERATOR. Description of the room: Bright and spacious room with two single beds. Description of the room: The room is equipped with a double sofa bed and two single beds. Description of the room: The room is equipped with a comfortable double bed, bedside tables and two armchairs. In walking distance from the mini-hotel there are many cafes, restaurants and bars where you can eat. Mini-hotel "Oscar" is located at a distance of 1 km from the cultural center of the city. The distance to the Belbek airport is 62.7 km. From the railway station to the hotel you can take a fixed-route taxi No. 82, go to the stop "Budenogo". There is a round-the-clock transfer order from any corner of the Crimea.